This article describes the Skill Will Matrix in a practical way. After reading you will understand the definition and basics of this powerful management tool. What is the Skill Will Matrix? 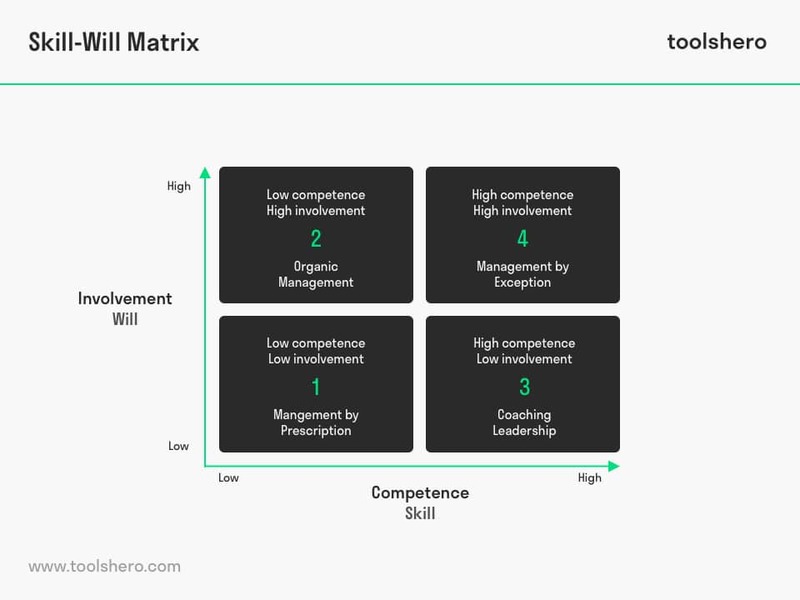 The Skill Will Matrix is derived from the model of situational leadership created by Paul Hersey and Ken Blanchard in the 1970s. Will stands for the involvement of the employee, and the extent to which he is risk tolerant. Skill, as the name suggests, refers to the employee’s skills. In addition, it is also important to consider the job maturity of the employee. A high job maturity means the employee can complete his tasks independently. He is experienced and knows exactly what is expected from him. Low job maturity, on the other hand, means the employee is not yet independent enough and requires a lot of guidance in carrying out his tasks. According to the Skill Will matrix, an employee’s performance is related to two aspects. On the one hand, his knowledge and skills and, on the other hand, his behaviour and attitude, the latter which mainly revolves around his will to function well and the extent to which he is risk tolerant. If he is risk averse, there is no will either. In the matrix, these two aspects are reflected on two axes. The horizontal axis shows the employee’s skill and capability. This is the Skill axis. Skill refers to the degree to which the employee manages his tasks and whether he has the right skills to work independently. The vertical axis shows the employee’s level of motivation and his willingness to work and carry out his tasks. This is the Will axis. An employee’s willingness is often directly related to his motivation. For example, certain circumstances may affect his involvement or willingness, and uncertainties may also play a role. What problem is and isn’t the employee willing to tackle? Hershey & Blanchard’s model of situational leadership has two dimensions, which are somewhat similar to the Skill Will matrix. In their model, the X axis shows managers’ degree of direction and/or task orientation. Here the manager demonstrates whether or not he is focused on the end result. The more he focuses on the end goal, the more authoritarian his leadership style becomes. The Y axis, on the other hand, shows the relationship orientation of the manager. To what extent does the manager attach importance to the mutual relationship with his employees? The more important the manager believes this to be, the more cooperative and participatory his leadership style will be. In practice, a manager does not approach every employee in the same way, however. Whether consciously or unconsciously, he will adjust his leadership style and take into account the individual employee. By considering the Skill Will model, the manager will discover that every employee works in a different way and therefore requires a different leadership style. With the two axes, the Will Skill model eventually allows for four possibilities, expressed in quadrants. Each quadrant has its own leadership style, which is in line with the model of situational leadership. An employee who is not yet fully capable and insufficiently motivated requires a more instructive and/or confronting leadership style. This leadership style is also referred to as Management by Prescription. The manager gives a lot of detailed instructions and explains what exactly needs to be done and what the quality requirements are. Both execution and results are closely monitored by the manager. In other words, he is very task-oriented. As a result, there is also a risk of the manager becoming too authoritarian and, like a teacher, telling the employee exactly what he should do. This leadership style only works with starting or inexperienced employees, who are taught what is expected from them through close supervision. They have a need for a more structured approach. For an employee who is not yet capable but sufficiently motivated, a more supportive, coaching leadership style is more suitable. It gives the employee more confidence. This leadership style is also referred to as Organic Management. By offering the employee training and other opportunities, his skills will gradually increase. Together, the manager and employee determine how the work should be approached. If the employee has need for this, the manager can help him in the execution of his tasks. One potential pitfall lies in the fact that the manager could start to patronise the employee. This leadership style suits employees who already have some experience in the organisation, but could still learn more. For an employee who is capable but who is (temporarily) not sufficiently motivated, a stimulating style is more suitable. In this situation, the employee requires a lot of consultation, and he has to be convinced of his own abilities. Together with the employee, the manager will discuss what needs to be done and what the employee’s difficulties are. It is the task of the manager to give the employee confidence and together analyse situations in which the employee faces setbacks. This form of consultation gives the employee self-confidence. However, one of this approach’s pitfalls is when the manager positions himself as a therapist. Instead, the manager must act more like a coach and guide the employee to the right path and make the employee more aware of his own actions. The employee has to become more self-confident. This involves an employee who is already fully capable, and who is more than just motivated. He is passionate about the work he does. This requires a more delegating style and the manager should involve the employee in the decision-making process. Moreover, he should give the employee the feeling he is performing his job well. The manager will leave the employee to perform tasks and, where the manager is unable to perform certain tasks himself, he may delegate these to the employee. One potential risk here is the manager leaving everything to the employee and falling back onto an ineffective ‘laissez-faire’ leadership style. Contact with employees and moments of evaluation are always important. It is the manager’s task to respond to all situations. For this reason, this leadership style is also often referred to as Management by Exception. To ensure effective leadership, the manager must adjust his leadership style to the employee’s abilities. After all, a starting, inexperienced employee has different capabilities and requires a different leadership style than a highly experienced colleague. When an employee is insecure or makes a lot of mistakes, it is a good idea to confront him and determine what the problem is. A short conversation can give the employee confidence again and convince him of his value to the organisation. Depending on the skill and willingness of the employee, it is advisable to continuously apply different leadership styles. What do you think? What is your experience with the Skill Will Matrix? Do you recognize the practical explanation or do you have more additions? What are your success factors regarding effective leadership? Landsberg, M. (2015). The Tao of coaching: Boost your effectiveness at work by inspiring and developing those around you. Profile Books. Obolensky, N. (2017). Complex adaptive leadership: Embracing paradox and uncertainty. Routledge.